Some of you might already know the Tetra Lockscreen app which is being developed by the Microsoft Corporation itself. All begann when Microsoft published the Live Lockscreen Beta App back in July 2014. 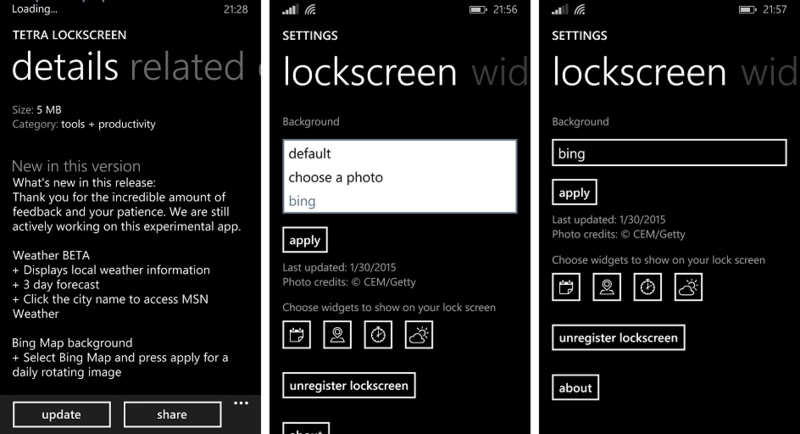 With this app a very popular feature came to Windows Phone what makes it possible to interact with the Lockscreen and develop apps which can use the Lockscreen. This doesn’t mean that it is possible to simply display the weather or something on the Lockscreen but that apps can really use this features so that you can use some features of an app without even unlocking your Windows Phone. However the Live Lock Screen Beta app still remains in version 1.0.0.0. since release, which means that the app is still glitchy and it is not really a pleasure to use. In case you haven’t heard of the app yet or haven’t installed this app to try it so far you can have a look at some screenshots below. Basically the Live Lock Screen beta app gives you the ability to show the clock and calendar in some different ways on your Lockscreen, furthermore it is possible to choose from various animations which are shown if you slide up to unlock your Windows Phone. This is definitely an awesome app by Microsoft and I am looking forward to use this app in the future, as soon as it receives an update. However that is why I am using the Tetra Lockscreen app currently which is also from Microsoft. What me impresses about this app the most is that it is totally customizable with some features still missing but since the app has recently received an update, the missing features will probably come soon. If you open the app, the first thing you will see are the options to customize your startscreen. First of all you can choose from 3 sources where your pictrues should be used from for the Lockscreen. What I like about this, is that it is possible to choose Bing Pictures, but you can also choose a photo or you use the default pictures which are also pretty nice. After you have set the picture source, click apply and all should be ready. Second thing you can do is to set the widgets you want to be displayed on the Lockscreen. Currently you can choose from 5 Widgets, which includes the Activity Tracker (for devices which support this feature), Weather, Current Position, Stopwatch and your Calendar. From these 5 widgets you can choose 4 to be displayed on the Lockscreen, maybe there will be added another space for a fifth widget with the next update. If you swipe to the left or to the right you get to the Widgets Settings where you can customize some of the implemented widgets. So it is possible for example to choose between a dark and a light theme for the ‘Current Position’ widget, and to set if the app can access cache your locations. For the Calendar Widget you can also allow to access your location, which is pretty awesome because if you allow it the widget shows you the location of the event in the background of your Lockscreen, you can also set the accounts which calendar appointments should be synced from. The last widget which allows some customization is the Weather Widget, there it is gladly possible to choose between C° and F°, you can let the app access your location or you set a location to display the weather from and you can set how often app should update the weather information which is displayed on the Lockscreen. So this are some nice setting which makes it possible to customize the Lockscreen even more with this app, but the most interesting part is probably the final product which is displayed on the Lockscreen, therefore I have implemented some Screenshots showing of the Widgets and the Lockscreen. Let me know if you like the app and what you think which features Microsoft should include in this app. If you haven’t installed the Tetra Lockscreen app on your Windows Phone yet, you can download the app below by scanning the QR Code with Bing Vision o by clicking on the app logo. Though you should know that the app is unfortunately not yet available for the Lumia 1520. [Report] Raspberry PI 2 is getting Windows 10… for free!